Superfruit Concentrate from Odylique is an amazing facial oil, I totally loved this product. It’s one of the best facial oils I’ve ever tried and perfect for winter. Its powerful ingredients will leave your skin nourished and make it glow but most of all they will tackle your fine lines and prevent any more damage from happening. Read a full review here. This is one of the few natural sunscreens on the market which won’t leave your skin white. This sunscreen will protect you from both UVA and UVB sun rays and will leave your skin feeling nourished. I wrote about it previously here. I love this natural hand cream as it’s non-greasy and quick to absorb. Great for keeping it in your drawer at work. It’s pretty affordable at £7.99 for 75ml. I managed to get it at a reduced price from TK Maxx but you can get in on LoveLula here. 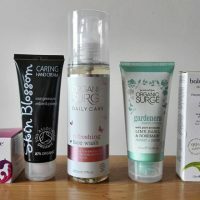 Rose Geranium hand cream from Skin Blossom is also a great hand cream to try. It’s probably not as quick to absorb as Organic Surge hand cream but still good. It’s made with 87% organic ingredients and certified organic by the Soil Association. Surprisingly it’s really affordable at £5.95. Until a few months ago I would wash my face with a natural, solid soap from Faith in Nature. It worked fine for my skin and I didn’t feel it dried it out but once the weather got colder I thought it’s better to use something more suitable for my face. I bought this refreshing face wash from TK Maxx for a good price and I was not disappointed. It’s a non-drying cleanser which will leave your skin baby soft and well cared for. I highly recommend it. I haven’t written a full review of this product yet but you can expect it in the coming months. Available on LoveLula for £6.95 (200ml). This is my favourite facial polish ever! Gentle, but effective. It leaves my skin amazingly soft. Certified organic by the Soil Association. Check it out on Neal’s Yard Remedies website and read a full review here. What a wonderful body oil from Botanicals this is! When it comes to scent Botanicals never disappoint and this body oil is no exception. Amazing sensual and exotic scent, just as described. I love it too much! Better than any body lotion as it’s 100% natural and 99% organic. It spreads easily and leaves your skin feeling nice and soft. A must have for a relaxing home spa experience… I received a small bottle of it as part of Naturisimo beauty box. You can buy it directly on Botanicals website (£20 for 200ml). If you are looking for a new natural mascara (or more natural one) then you really have to consider the one from Green People. I bought it based on reviews I read and recommendations from fellow bloggers and I am not disappointed. It nicely lengthens the lashes and really makes my eyes stand out. The brush is thin enough which makes applying mascara easier. Get it on Green People’s website here (use code BOX15 to get 15% off, expires soon). So there you have it, some of my favourite beauty products I discovered in 2016! What were your favourite beauty discoveries of 2016? The face oil sounds amazing. I always struggle to find ones I love. Interesting, I found so many face oils already which I think they are great! Great natural mascaras are always a mission so that Green People one is going on my list. The Botanics oil sounds lovely. I love Green People’s mascara but I would just add that it’s not exactly waterproof in case that was important to you!